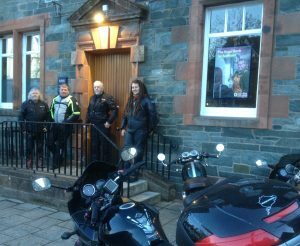 Five of us went to Aberfeldy on Tuesday, a clear and cold night, Drew’s BMW registered only 1 degree over the hill at the Griffin wind farm! The rest of us had taken the bottom roads through Dalguise and Grandtully but the chipper provided good grub even if we had to eat it in the rain outside. Tough guys or what….even missed deer on the road (twice), kamikaze pheasants (often) but we couldn’t miss all the potholes. See all our next events on the What’s On tab. Sunday Run on 7th May and Maggie’s Run on the 14th.